The Zambezi River is the fourth-longest river in Africa at an impressive 2,574 km long. The Zambezi River winds its way to the balmy Indian Ocean from its source in the heart of Africa. The source of the river is found in Zambia where it flows through Angola, Namibia, Botswana, along the border between Zambia and Zimbabwe until it finally flows through Mozambique and into the ocean. The most famous part of the river is the mighty Victoria Falls. Other falls that can be found along the river are the Chavuma Falls which is found between Zambia and Angola and the Ngonye Falls found in western Zambia. Due to the churning rapids that dot the river’s course, long-distance travel is not feasible along the Zambezi. However, few locations around the world offer the glorious sunset vistas one finds when taking a cruise along the river. The puffs of water spray, droplets dancing in the light and the abundance of wildlife milling along the banks make for authentic Zambian experiences. The Zambezi River’s banks are quite isolated and protected from human settlement, allowing you to soak in nature’s bounty undisturbed. Rovos Rail luxury train tours allows its passengers to embark on a sunset cruise whilst visiting the Victoria Falls. Lazing on the boat, cool drink in hand and the noise of the savannah around you, you will feel utterly relaxed as you snack on tasty eats and socialise with those around you. 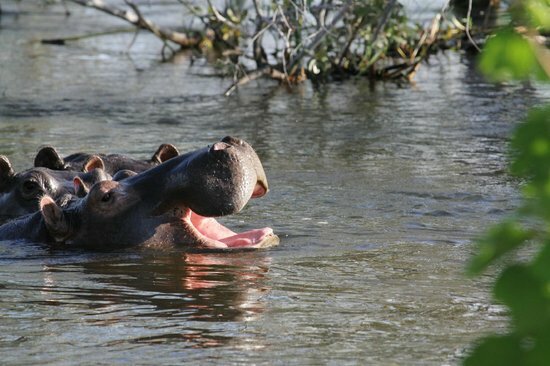 Wildlife that will greet you include hippo, giraffe, crocodiles, buffalo and elephant who may raise a trunk in greeting. The bird life along the river is diverse including heron, egret and pelican. The well-known call of the African fish eagle will resound amongst the shrubbery, alerting you to the fact that you are definitely in exotic Africa. The greatest thing about the cruise is the plethora of exquisite photographs you will have the opportunity to capture, making sure you will always remember your journey to the wild and wonderful Zambezi.